Yes!! I am very happy that so far things are going well, and I shouldn't worry. -Planted flowers for my mother. -Made the ground ready for seeding, and made it look pretty. -Waited in agony for things to grow. Today I think I bought the rest of the seeds and planted them in the rest of the rows I had made. -Planted the rest of everything and squished these red bugs on my cucumbers! -Planted my hanging planter for the tomatoes. It fell after I put it up cause I was fiddling with it. But it's OK.
As of 5 days after planting my radishes on the 15th of May, I noticed they had popped up on the 20th. -I noticed the lettuce was coming up. -The radishes had gotten considerably larger, and I thinned them to 1 per inch. -My tomato plant in the ground has stayed healthy after being abandoned in a plastic cup for a while. Seems like leaves are darker. -The tomato in the hanging container is going well after falling when trying to put up and being left in its container too long after buying. -The tomato in the pot is doing well and has some yellow whitish leaves. Snipped off shriveling lower bottom one, and new ones growing in place. -Cantaloupes have no sprouts. Probably due to not enough sun... if they sprout I might move them to sunnier location. -Little backups haven't sprouted yet but probably will in half a week or so. It took the biggest plants one and a half weeks to pop out. WATER MORE OFTEN. -Cucumber plant doing well after being snowed on, and looks like it retaliated a little. New leaf growth. -Basil leaves noticeably growing many new leaves. -Lemon balm growing lots of new leaves. Slightly greener than older ones and shinier. -Parsley growing small, but new leaves. -Mint doing well but has some random yellow stripes probably from leaf breakage. Little part sticking out is actually growing. -Not really doing much to keep cats away, but the stems are getting taller and doing well brother stepped on one, but it'll be fine. [[[NOTE TO SELF: WATERING MAKES PLANTS GROW FAST. THE MORE OFTEN YOU DO IT THE FASTER THEY GROW. If I water just about every other day then i'll be good. =?=?=?=?I'm not sure what pea sprouts look like! or carrots... and my onions look just like grass!=?=?=?=? =Mint is MINTY FRESH but would be cooler if were more pungent. Maybe try spearmint next year if it isn't already that. NOT SURE WHAT MINT IT IS. =Parsley doesn't smell too much cause it isn't too pungent. =Oh, and I did the turning over and thinning just tonight, with a flashlight and I caught two cats sneaking in the yard! =And if cats poop in stuff. REMOVE POOP AS SOON AS POSSIBLE TO NOT POISON SOIL. Use pooper scooper.... Block off entrances. Parsley is not aromatic like some, but if you crush the leaves it does have a nice kind of pungent very parsley-ish smell. It's one of my great garden discoveries. I never thought I liked parsley until I started growing it; the parsley in stores and decorating restaurant plates is so tasteless. But mine is flavorful and wonderful! Re: [[NOTE TO SELF: WATERING MAKES PLANTS GROW FAST. THE MORE OFTEN YOU DO IT THE FASTER THEY GROW. If I water just about every other day then i'll be good. Up to a point that is true but it can be overdone. You can't really water on a schedule if growing outdoors, because it depends on heat, humidity, rain, how fast your soil dries out, needs of different plants. Lots of things like to dry out a little bit between waterings, not to stay wet all the time. I assume you mean grass clippings. As long as you cut your grass BEFORE it goes to seed, the grass clippings will be fine. But you can't "sprinkle" grass clippings to keep weeds down. You need to lay down some inches of grass clippings. Re 'm not sure what pea sprouts look like! or carrots... and my onions look just like grass!=?=?=?=? Pea sprouts are thick and "muscular" looking, about the width of the pea they came from. 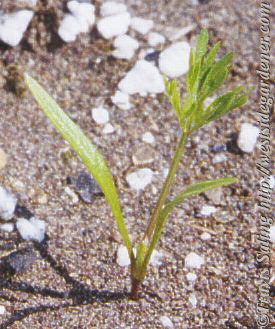 Carrot sprouts are delicate and feathery. And the onions do look just like grass when little. Enjoy the great garden you are making! Thanks so much! when yis your grass usually supposed to go to seed? Last edited by supagirl277 on Sat May 29, 2010 6:24 pm, edited 1 time in total. Don't worry about the onions, just give them time and keep the weeds down and they will slowly send out more grass-like leaves and thicken up. I finally found pea sprouts! They were pretty big, and I actually think I missed them the last time I checked. There is another squash popping up, along with another squash that did pop up. So now there is 4! I don't think my zucchini is going to grow many seeds... there is only one so far, and I don't see any more. I have some back ups, but I don't think they'll live either. The hostas are getting leafier. I planted some 6 foot flowers!!! Under them I planted 2 blue 20 inch flowers. Around them I planted 3 yellow 18 inch flowers. The purple clematis that are growing on the arbor-trellis over our fence door are growing awesomely. The buds are huge and about to pop. Whew I did lots today. We went to the store to get some PVC piping to come up from an outlet from where our sprinkler system is and make a valve to attatch a hose to. Theres outlets in every section of usable planting ground so that's really helpful. We got the hose and hooked it up and for the first time i just let the water run down the rows instead of overhead watering so it got a good soaking. All of the seedlings have popped up excpet for the cantelope in the ground. That was expected. The peas aren't doing so well because I have only counted 5 seedlings out of the 15 or 17 feet of ground that I planted them every two inches in. Cup seedlings for the zucchini and the cantelope HAVE started growing So I will transplant the zucchini one where it is in the ground so the one there won't be alone, and the cantelope in a new sunnier spot in the ground. We got some topsoil for the flowers near the house in the back, because there is a lot of clay underneath te peat moss stuff we have on top. We are going to get some black tubing for an irrigation type drip system for the veggies and the pipes will run along certain places and just cut off at the plants, and the ends of the rows so they just flow a lot. The cucumber and squash cup seeds didn't grow, so I'm just gonna not do them since I already have a cucumber plant, and 4 squash seedlings that I'm goning to have to thin down to three anyway. We got a dandelion puller. I noticed that the tomatoe hanging plant doesn't get a lot of sun until the end of the day. We hooked up the mini sprinkler system to the flower beds and fixed the leaks. The place where I turned over the soil around the plants inbetween the rows are not growing any new weeds, so I know that works. I'll some more cultivating inbetween plants when they're bigger. The basil now have 2 sets of new leaves since I first bought them. In one of the cups though, I noticed little grubs in the soil... I got the soil from the same place I planted my veggies, so I hope to high heaven that there aren't more in there. I have been using grass as a mulch since the beginning. Well in my second year of gardening after I realized that big hardwood mulch is not the best thing to use. But I put it on while it's seeding, with weeds whatever. I don't have problems and if there is a little something coming up just put down more grass problem solved. I got outside and watered my potted plants with a big glass measuring bowl. Forgot to water the hanging tomato plant. Went to the garden and meticulously tried to find The individual lettuce plants to thin. Kinda hard, but I did it. I brought out the spinach seeds and other radish seeds to plant, plus The cucumber plant. I made some new rows over on the other side or the canteloupe. Planted one mini row or them both. The radishes are getting their second sets of leaves that I believe are called true leaves. The zukes and squash are slowly growing their second set. I transplanted the zuke to ground level. Squashed more red spider mites on the zuke plant that I thought was a cuke! Oh well, I got a new cuke plant to plant. Put some top soil over the little flower patch on the side of the house. I think I'm going to plant some corn in the fall. I thought about planting a bed of potatoes over by the cuke it would be something new. We turned on the sprinklers finally! And in the flower garden too. The lemon balm's leaves are burning on the outside a little, so keep in better shade. gixxerific wrote: I have been using grass as a mulch since the beginning. Well in my second year of gardening after I realized that big hardwood mulch is not the best thing to use. Grass is awesome! After doing some areas with it last year, I want to do the whole garden with it this year! I hope I can get a hold of enough. WOW! you've done alot, hows the cantalope doing? Well, can't do everything but I can try to do most. It's doing well so far Haha. The backup seed popped up a little after the three ground seeds popped up. I was so happy that they popped up cause I didn't think they would. So since I haven't posted here for a while, I'll just say everything that's happened lately, and hope I get everything. I picked my radishes and they were delicious! I grew a new row of radishes. I didn't do the potatoes. The peas are getting pods. The lettuce is huge, so I'm harvesting it. The onions all but died out because of how frail they were. The carrots I've just left alone to grow. The cantelope have many leaves But it's growth is prbly stunted by how shady the area it's growing in is. The zucchini on the ground is HUGE. The squash on the ground is HUGE also. The tomatoe plant on the ground has gotten considerably large. The pepper plant has 2 peppers, and is finally starting to grow new buds after I plucked them all. I only have 3 corn sprouts :/ But they are doing well. I might do a later crop and maybe plant them better. My back-up cantelope seed died, and one on the ground died too. So i only have 2 now. The herbs are way big now. The tomatoe in the hanging pot is dying. The tomatoe in the pot is not growing upright... but it has little tomatoes as does the one on the ground. Lot's of them. The zucchini in the pot got too much sun so I put it in a more shadier spot on my deck. The leaves are starting to not look as broad, but have a larger slit inbetween wherever there is a point in the leaf. There are zucchini and squash growing on both plants. The cucumber has fallen over and started to vine out and grow little "arms". It has little cukes on them too. The flowers we planted on the side of the house are doing well, even the snap dragons. There are almost every color of them growing. The plant in the back of the flowers that was supposed to be 6 feet tall was a mis-labeled flower, and instead got the same flower as the ones it was surrounded by. The clematis are growing vinier and the flowers are growing smaller and lighter and higher up on the vine as the season goes. One of our hostas has a ton of white flowers growing out of it's stalks, and it has two stalks. It's the only one with flowers tho. Our bushes by the fence in the front have shed their tiny flowers and have gotten much larger. The bushes on each side of our stairs in the front are getting bigger, and the one that almost died is doing much better, but is still very small compared to the other one. The flowers in the front and getting very bushly, and the ones in the center of the garden are starting to lose color and not grow very tall. They look out of place. We hooked a hose up to one of the many areas that my dad set aside for auto sprinkler systems for the patches of the earth that contain garden space, and it's much easier to water. We might start using quarter inch tubing to water my plants. I've found that I also need to get a much larger cage for my tomatoe. My basil has been growing flowers. I let a lot of them mature, but after a bit I plucked them off. The mint was starting grow flowers but i pinched them too. My strawberry plant had two strawberries, but they are tiny! I picked them too late thinking they'd get bigger, and they were wilted. Transplanting a raspberry into a pot is not likely to survive given they don't have very many roots to survive with. The raspberries on our side of the fence are growing nice berries though. My bearded dragon bit me because she wanted to go in the back yard and I tried not to let her :/ It hurt! This is mostly everything that has happened lately haha. Hope I didn't miss anything. If I do i'll just post it later. I'm growing spinach now. Spinach doesn't like hot weather and may not do too well for you right now. Tends to bolt and go to seed very fast without producing many leaves. Try planting it again in August or so for a fall crop. The lettuce is huge, so I'm harvesting it. The lettuce and peas are also cooler weather crops that can be started again late in season for fall crop. The cantelope have many leaves But it's growth is prbly stunted by how shady the area it's growing in is. Yup, it is a full sun plant. The squash on the ground is HUGE also. Are your zucchini and squash plants blossoming/ fruiting? They should be by now. If they have fruits, you will want to put some cardboard or something under the fruits so they don't touch the ground, to prevent them from rotting out. The tomatoe plant on the ground has gotten considerably large. Is it staked/ caged? Some people grow tomatoes just as vines sprawling on the ground. Since you are in Utah (ie not much rain and not much humidity) that may work for you. Most of us find that tomatoes grow better, produce better and are less susceptible to disease if supported. There is a sticky at the top of Tomato Forum (thanks TZ !) re how to do that. The pepper plant has 2 peppers, and is finally starting to grow new buds after I plucked them all. Why did you do that? No flower buds, no peppers. I only have 3 corn sprouts :/ But they are doing well. I might do a later crop and maybe plant them better. Corn doesn't tend to do as well if it is isolated plants. They do not self pollinate and need to have other corn plants around them for pollination. It does better planted in a block than in spread out rows. The tomatoe in the hanging pot is dying. Was this a topsy -turvy or just a regular hanging basket? What kind of tomato? Full sized tomato plants need like a 5 gallon bucket worth of soil to feed them. The soil in hanging baskets tends to dry out very fast. It would need to be watered twice a day in hot weather. And then you would be flushing out all the nutrients so it would probably need to be fertilized every week or two. The tomatoe in the pot is not growing upright... but it has little tomatoes as does the one on the ground. Lot's of them. See above re stakes/cages. Tomatoes are vines. They do not grow upright or support themselves, but they do in general do better with support. My basil has been growing flowers. I let a lot of them mature, but after a bit I plucked them off. Yes, you do not want it to flower or go to seed. It stops making leaves then and may get more bitter. Keep pinching the flowers off, at least back to the next leaves. The mint was starting grow flowers but i pinched them too. But I do let the basil and mint have a few flowers here and there (but don't let them go to seed), because the honeybees really like them. My strawberry plant had two strawberries, but they are tiny! I picked them too late thinking they'd get bigger, and they were wilted. If this is their first year, you usually would just pinch off the blossoms, to let the plant get better established. Strawberries next year! Otherwise it sounds like everything is going well and your garden is getting big and lush! Haha! Ya most of those things you said i kinda already knew, just some of my plans got foiled lol. I am planning on doing a fall crop so i can get better corn turnout-age and spinach and peas. I'm pretty much learning some things as I go, but I do have some knowledge haha. Just making sure i learn from experience so i don't overdo it haha. '11 LOG - Of course they have Life!